Tool Hex Helper Double OH! May 24th, 2016 (2:47 PM). Location: Not gonna tell you. I don't know why, but every time I try to open the program it never loads. The process shows up in Task Manager, but I don't see the program anywhere. Not even an icon. The idea for this is very cool though. Especially the way you can implement the more basic ASM material. It may seem like a lazy shortcut to some, but a lot of them are hassles for others, so this is useful. May 24th, 2016 (6:56 PM). What OS are you running? It's working fine for me on Windows 7 and 10. May 25th, 2016 (4:25 AM). Ironically enough, Windows 7. Should I restart my computer or something? I have no idea whats causing this if it works fine for you. May 25th, 2016 (8:12 AM). May 28th, 2016 (4:13 PM). Okay so I fixed the problem. Basically I added it into to the external programs in the latest version of Pokemon Game Editor. I clicked on it, and it opened. No hassle or anything. July 12th, 2016 (2:05 AM). Could you please add trainer facing and give Team Rocket special music. August 3rd, 2016 (12:27 PM). Hey just wanna let you know the 'Failed! Please make sure that there is no other program with your ROM opened.' error is still very much there. It happens most always with the BW repel patch, and sometimes with the lvl1 babies & deletable hm patches. Every now and then, but rarely, with the Pokédex fix patch. If nothing can be done, oh well. December 29th, 2016 (10:50 PM). So after not really working on Hex Helper in the last several months @TheRealOCD held me at gun point and was like. Remake that muk. So I did. 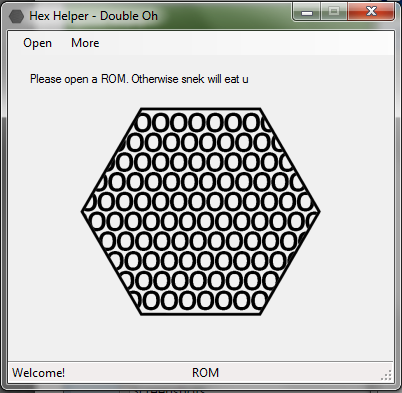 Hex Helper Double OH! is Hex Helper written from scratch in order to help keep your ROM safe. -The UI has changed a lot. No more ugly buttons. Now simply click a checkbox to insert/remove any of the modifications Hex Helper Double OH! has to offer! -It's safer! Backups are made every time you load the ROM! -And some more Patches for Fire Red and Emerald with possibly more to come! December 30th, 2016 (8:39 AM). The rival in Red and Blue is called Green. Gary is some character from a lame cartoon. December 30th, 2016 (9:18 AM). December 31st, 2016 (8:15 AM). How about a force deoxys obey checkbox? August 1st, 2017 (2:45 PM). October 13th, 2017 (10:21 AM). Edited October 16th, 2017 by LanceD. What does the 252 EV limit patch do, exactly? What's the A-Map face down bug? EDIT: Ok, so I read up on EVs and I get what the patch does, now. That leaves the AM thing? February 6th, 2018 (1:58 PM). What does the Fix Tall Grass and Fix A-Map Face Down bug do exactly? February 6th, 2018 (2:36 PM). The first one allows you to use tall grass in FR like RSE had in the routes around Fortree City. Its most easily remembered as the kind that doesn't allow you to cycle through it. Just set the behaviour byte of a tile in Advance Map to 03 to get the animation. The A-Map Face Down bug is pretty notorious as there is a broken NPC behaviour byte that causes the game to break if the player gets into a battle/ opens the menu while an OW with the behaviour is on screen. Lots of new hackers use it rather than select the 'No Movement' and wonder why their games are crashing. Spherical Ice fixed it a while ago. March 16th, 2018 (4:58 PM). Edited March 16th, 2018 by Carusi. Hello. The evolution without national pokedex didn't work for me. Nothing happened when my Taillow reached level 20. I also marked the running shoes and run indoors patches and those worked fine. Do I need to mark another specific patch alongside it to get it to work? EDIT: Sorry, nevermind. I got it to work. Thanks a lot for this wonderful tool. May 12th, 2018 (5:01 AM). If I apply the decap patch on a ROM where I've already inserted the Repel system, the message appears, but it won't use the Repel even if I say Yes. Meanwhile, if I do the opposite and try to apply this function on a ROM with the Decap patch applied, HH2OH acts as if the Repel system has already been inserted, even though I didn't do anything. However, If I deselect the option from HH2OH menu and then insert the routine appears to work fine. I could go with this, but I would like to make sure I won't find any bugs later on before proceeding. Anyone could help? May 13th, 2018 (11:20 AM). What decap patches are you using? May 14th, 2018 (5:46 AM). This is the one I have used, I found it on a thread here (cannot post the link for now). The only decap patch I could come across since Wichu's one vanished. May 14th, 2018 (8:34 AM). Ill take a look at it later today. May 14th, 2018 (9:41 PM). Okay so from what I can tell, is that part of the ASM that gets inserted according to the original tutorial by @Darthatron overwrites some text used by one of the day care people. The reason the program is tripped into thinking that the patch is already inserted is because the decap patch that you use changes this script. If I get some free time later this week I'll add an extra check for this patch. But as long as you remake the script if you plan on using the default day care. Always make sure you have backups anyways! June 2nd, 2018 (1:04 PM). Thanks for the wonderful tool. 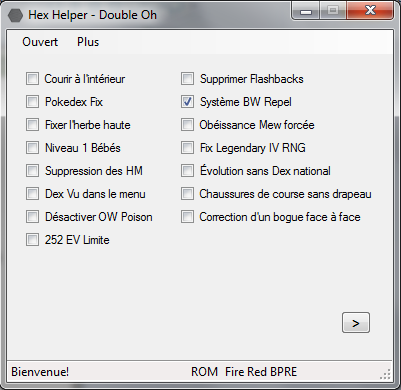 Saves a lot of time when you need to fix things in Firered without searching old threads for the hex values.